After some not so nice weather early last week, the forecast was for a few days of 'normal' weather. 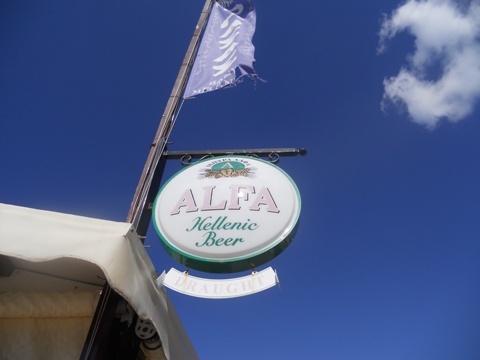 On Thursday afternoon (yes, afternoon, the weather is now cool enough to contemplate walking in the afternoon - still mid 20s though) fortified with an ice cream we walked from Vathi to Abelike Bay, where we've anchored numerous times. It's not very far but it was interesting to see from land where we've sailed. After an appropriate refreshment in Pirate's Cove, somewhere we'll return to next year as it's closing this weekend, we returned home, really looking forward to being able to don our walking boots and explore inland Meganisi in the coming weeks. On Friday we decided to head to Kalamos, for a number of reasons; firstly, although we've been there once with Pipit and I skippered a day charter there already this season, it is where Project Tethys was hatched so always has a special place in our affections; secondly, on our last visit with Pipit my enjoyment of Chicken Diabolo for dinner was rudely interrupted by the previously reported anchor chain incident; thirdly, as the weather is cooler now 'Fish Soup Kalamos' would probably be back on the menu, something I remember from charter holidays as being rather good. So in case this transpired to be our last sail of the season to anywhere inhabited and open, Kalamos it was. 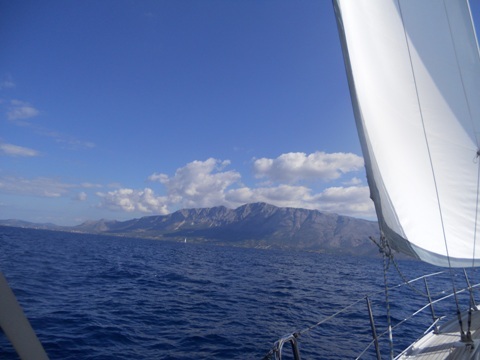 We had a much better sail than anticipated, given the wind forecast; in fact, it was one of the nicest sails of the year, flat seas, a bit of tacking and reasonable speed under clear blue skies. We headed to George's Taverna at 8pm and found the first fly in the, er, soup - 'Fish Soup Kalamos' was finished - it seems I should have reserved that along with the table at lunchtime. Never mind, we'll just have to return sometime after the 15th of April next year when George re-opens. Instead we shared a starter of prawns in garlic and both had the Chicken Diabolo, a dish we've not seen anywhere else, and it was very tasty, with no interruptions this time! There seem to be many variations of the recipe, but we shall try to replicate Maria's (Mrs George) version, including the feta cheese. It would have been rude not to end the meal with a baklava, so we did. As predicted, the easterly wind came up in the wee hours of Sunday morning but we were fine where we were. 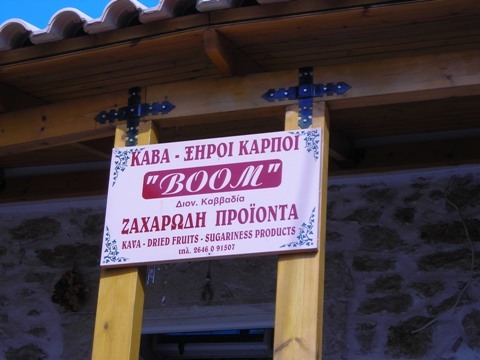 We've never seen spray coming over the wall at Kalamos before, and those who ventured out in the morning had a roller coaster ride just outside the harbour entrance - it is very shallow there, so yachts were pitching to the extent that they were burying their bows in the waves. We thought better of it, especially as we'd seen as little as 0.3 metre under our keel on the way in and would quite possibly have grounded. George assured us that at 1230 the wind would finish and the sea would be as calm outside the harbour as inside - who were we to argue? George was wrong - it was actually 1235 when all suddenly became calm - the Med can be a strange place. We bade our farewell to George and departed without any crossed anchors, a first at Kalamos this year! 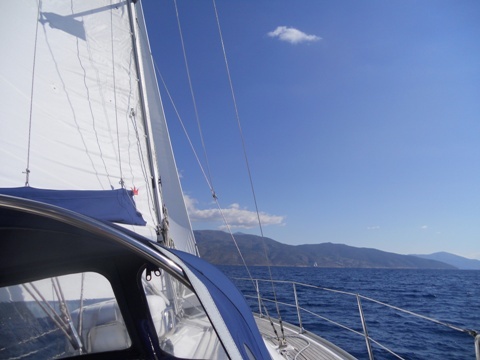 Of course now there was very little wind, so we were resigned to motoring the whole way back to Vathy, but soon after rounding the headland east of Kalamos we had enough wind to sail. 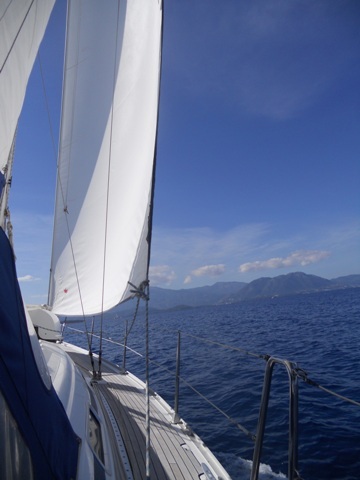 A little later the wind shifted to the north and we had an even better close-hauled sail nearly all the way back to Vathy, again under clear blue skies, although under the shade of the bimini the air is now a little cool for just t-shirts. To top this off we were treated to a short visit from a pod of dolphins, something from which we never tire. Our return to Vathi, with Skorpios Island in the foreground and Lefkada Island behind. Once back in our berth at Odyseas Marina, we took down the bimini - a sign summer is over? Well maybe, but mainly because there is nearly a week of rain forecast and the bimini tends to collect water and sag - a result of the unavoidable compromise integrating it with our stern arch. It could do with an extra support bar, something we may look into adding. 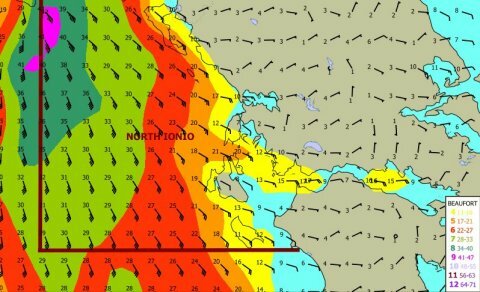 The forecast is better towards the end of the week, so we may still get to Fiskardo, if for nothing else to go to the Thai restaurant there, but if we don't, we won't be disappointed if our lovely sails to Kalamos and back turn out to be the last of the season, apart perhaps from the odd day sail.